All lino blocks & woodcuts are cut, printed and hand coloured by Bruce in his Palm Beach studio. They are printed on 250-300gm Velin Arches warm white paper unless stated, using oil based Black luxe C ink and hand coloured with artist's quality French gouache. Most are editions of 25 with some artists proofs. Slight colour variations may occur as the are printed and coloured to order from the large collection of blocks. View the images of the available prints displayed in the Print Gallery where you can also place an order for a print or prints. Curiosities, Flora & Fauna, Marine and Tropical. B.G. : I have always loved the look of relief prints. A woman who lived in our street when I was a schoolboy was an artist and her son was good friend. At age 12 she gave us both some lino squares and tools & I did my first linocut. At art school I went on to do more, inspired by the German Expressionist woodcuts of Kirchner & Nolde. 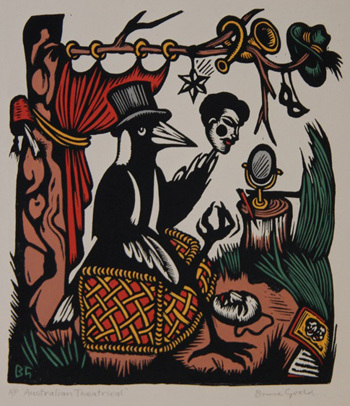 As a young artist developing his style and aesthetics, Bruce was impressed by the exhibition A Survey of Australian Printmakers that he saw at the Ward Gallery in Glebe, Sydney, which showed the work of Australian artists from 1900 to the 1950s. In 1976 Nicholas Draffin, then curator of prints and drawings at the Art Gallery of New South Wales, published his book Australian Woodcuts and Linocuts of the 20s and 30s, (ISBN 0 7251 0224 1) which reinforced Goold’s interest. An antipodean form of American and English Abstract Expressionism dominated the post-war period; ‘floral still life' was badged unfashionable and decorative. Now, this aesthetic was re-emerging in the 1970s through the rediscovery of these skilled and powerful images. Bruce had found a medium that suited his artistic and still itinerant lifestyle. He bought squares of linoleum, cutting tools, ink, Japanese paper and a bamboo printer’s barren. B.G. : I was smitten by the images of Australian flora and fauna and the quality and power of the works by the best practitioners of the period: A standout was the bold woodcut of banksias by Margaret Preston, black ink on cream paper, toughly incised, redolent of the savage cones and serrated leaves after a bushfire. I did of a couple of linocuts of Banksias cut from the garden at Whale Beach that looked quite Prestonish, hard to avoid when you have the same subject and are working in a similar medium, but I was thrilled with the result. Currawongs, magpies, kangaroo, strelitzias, iris, anthropomorphic birds and neo-expressionist figurative works followed, punctuated by spiky banksias and waratahs. My stable of one, the only living printmaker I have represented. His approach whilst mirroring that of established printmakers such as Margaret Preston, is more direct, freer, more immediate, his hand-colouring fresh and vibrant. A retrospective exhibition, Bruce Goold, Artist, Designer, Printmaker, curated by Therese Kenyon, was recently held at Manly Art Gallery & Museum, Sydney in 2008. Bruce's most recent commercial gallery exhibition was inclusion in Artists Prints Made with Integrity, at Australian Galleries, Melbourne, 2010. In November 2010 Australia Post released Goold's linocut designs for the official Christmas stamp set. Bruce Goold is represented by Stuart Purves and exhibits at his respected high profile Australian Galleries in both Sydney and Melbourne. Editions are generally of 25 with 5 artists proofs. They are printed on Velin Arches, 275-300 gsm, warm white paper, (unless otherwise stated), using a flat bed press with Charbonnel black etching ink. The print is allowed to become touch dry before it is hand coloured using the finest French Linel gouache. Please be aware that as the prints are hand made there is not always an edition number ready for delivery and there may be a delay of up to one month in dispatching the order to you. The prints are dispatched in strong cardboard tubes and sent by courier or registered post. Please Note: Being of superior archival paper the prints will flatten out on removal from the tube, if weighted each end and left overnight. A reputable framer of your choice generally attends to this process.